My daughter loves to wear t-shirts from Crazy 8 and is always thrilled when her subscription to National Geographic Kids Magazine arrives in the mail; so I knew she'd be enthused to find out the two have partnered together to create a line of cool shirts. The children's clothing brand Crazy 8 is highlighting eight fun National Geographic "Weird But True" facts on special tees for girls and boys. The shirts feature butterflies, dinosaurs, porcupines and sharks, among other things, in children's sizes XS to XL that each feature a topic taken from the popular "Weird But True" section of National Geographic Kids Magazine and the corresponding Nat Geo best-selling app and book series. She excitedly picked out the butterfly shirt from the collection which sports the phrase "BUTTERFLIES taste food with their FEET" for us to bring home. 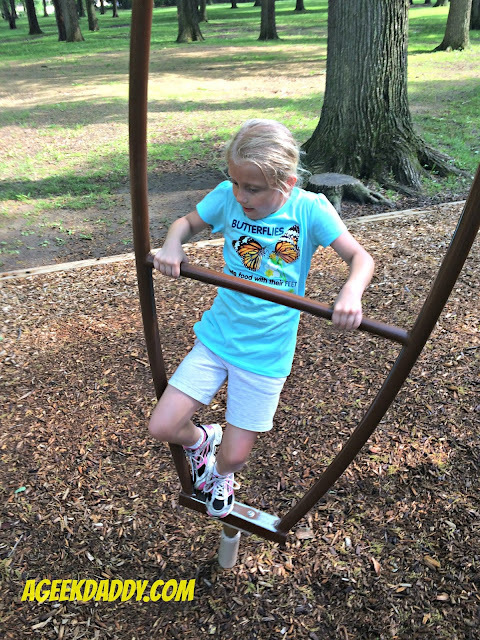 We decided to break in her new shirt with a trip to the neighborhood park to see how well she could whirl around and fly about like a butterfly. 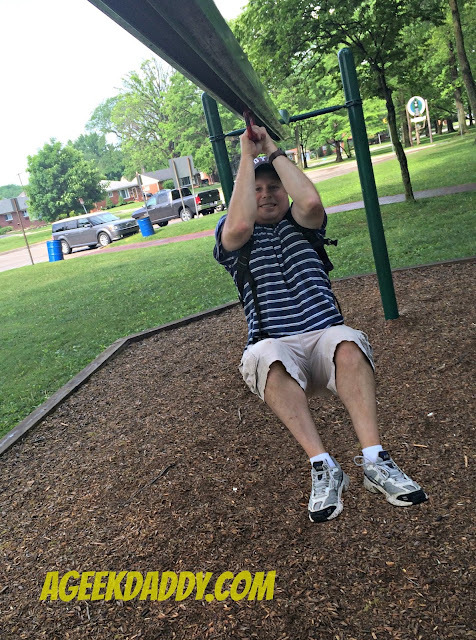 The playscape has an interesting feature that lets kids climb on and be spun about. While it looks dizzying whenever riding it she is all giggles and constantly requesting me to spin her about faster and faster. 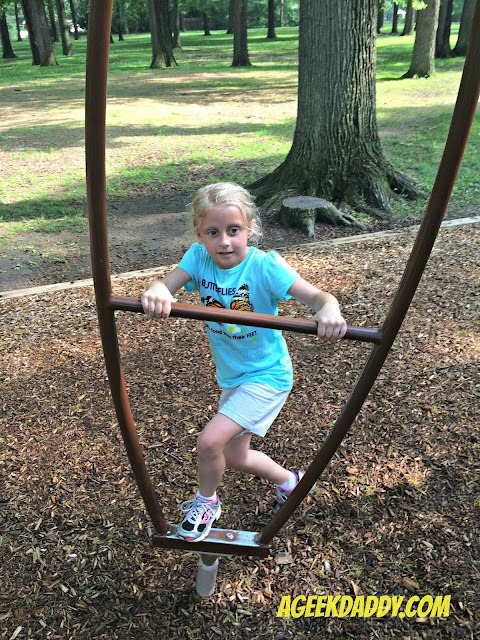 My daughter wobbled about after getting off that spinner very much resembling the motion of a butterfly flipping about between flowers as it tastes its food with its feet. Next we were off to the playground zip line to fly like a butterfly. From the look in her eyes you'd think she wasn't having fun, but my daughter always wants to soar across the zip line again and again whenever we head over to the park. She even persuaded good old dad to give it a try! There you have it! 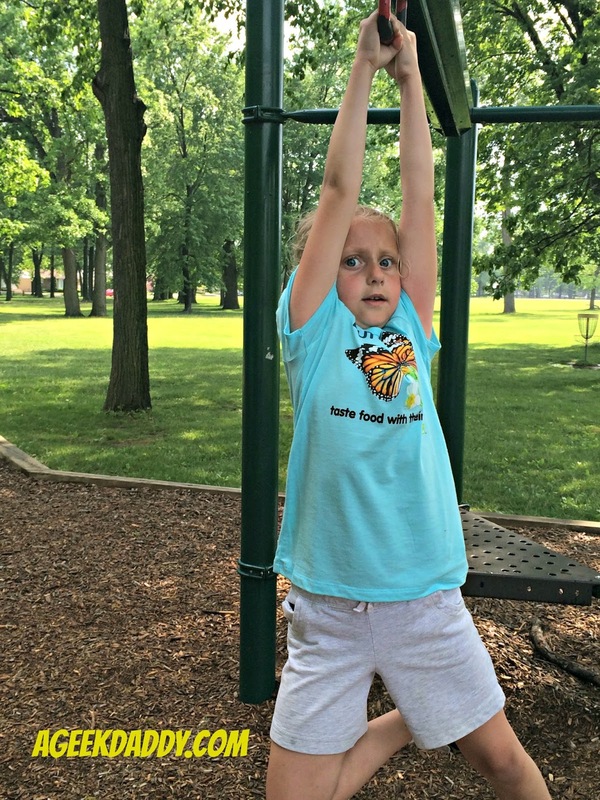 The Crazy 8 "Weird But True" National Geographic t-shirts have been butterfly tested and approved. To get your own visit Crazy8.com or visit one of their stores located nationwide. 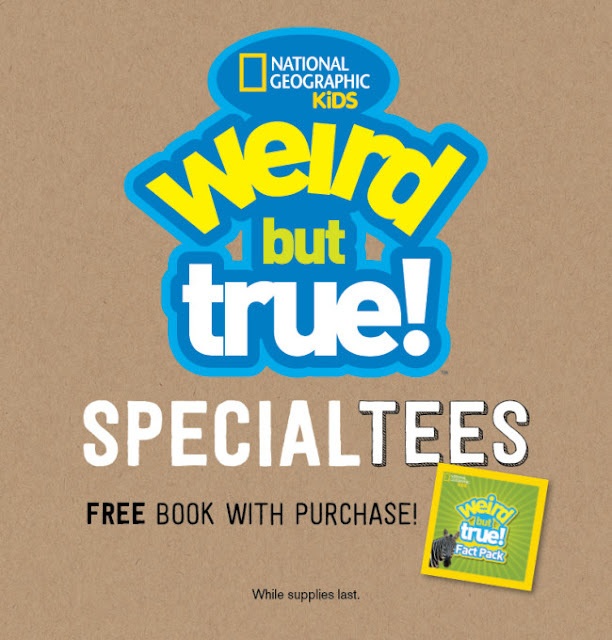 While supplies last, in-store purchases of any of the 8 National Geographic "Weird but True" shirts will also include a FREE "Weird But True" fact pack. Sorry this free fact pack giveaway doesn't apply to online sales. 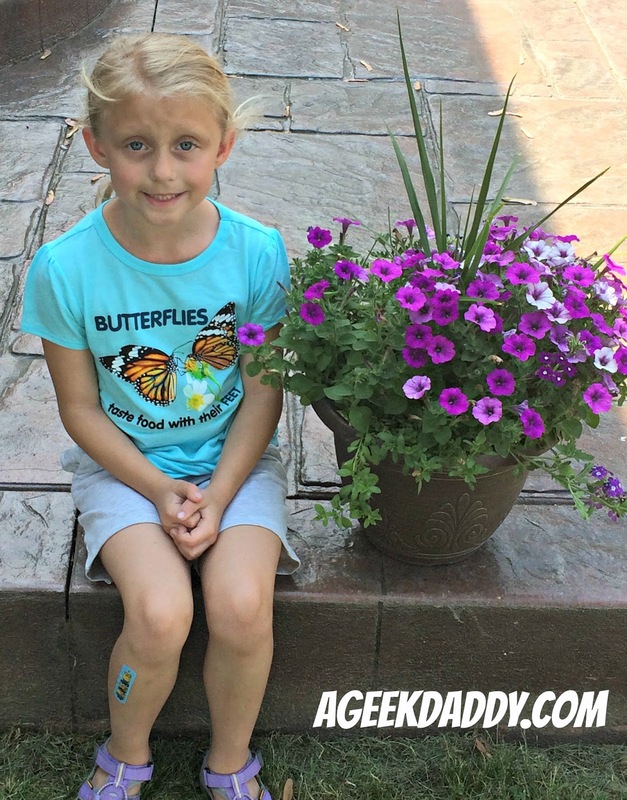 To share my daughter's enjoyment of her "Weird But True" t-shirt, A Geek Daddy is also giving away a $25 gift card to Crazy 8 so one lucky blog reader or social media follower can purchase their favorite special tee from this National Geographic collection. For a chance to win, visit Crazy8.com and look at all the "Weird But True" t-shirt options. E-mail thegeekdaddy [at] yahoo [dot] com with the subject line CRAZY 8 by Sunday, June 12 @ 11:59 pm EST. Include in the email, your full name, mailing address, and the "Weird But True" fact printed on the front of your favorite Nat Geo shirt shown on the CRAZY 8 website. UPDATE: Congrats to Carol from Mt. Clemens, Michigan who won our Crazy 8 giveaway. We will randomly pick a winner from all valid entries. Must be a US resident over 18 years old to participate. No P.O. Boxes allowed for delivery of the prize. One entry per person and winner will be selected from all eligible entries with the prize being mailed directly from A Geek Daddy. By participating in this promotion you waive any liability of any kind against the publisher of this blog. A Geek Daddy is providing this giveaway contest as a benefit to our readers and social media followers and is hosting this promotion in association with the blog's participation in the National Geographic Kids Insider program. Emails will only be used to contact winner and all will be deleted following the conclusion of the giveaway.